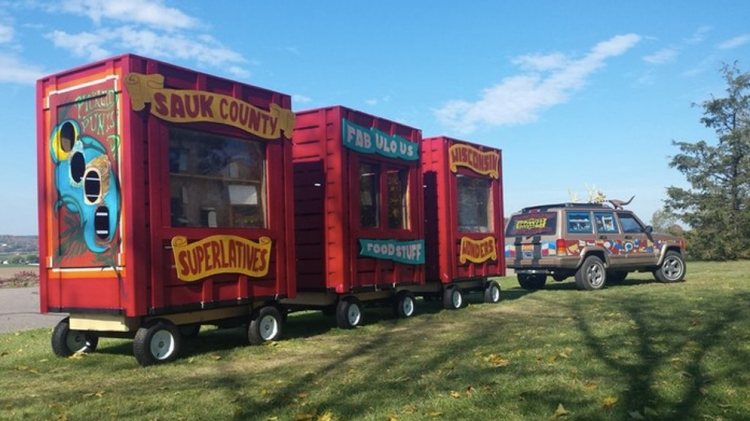 Today we're hearing from Erika Nelson, a Kansas-based artist who won a Featured Public Projects grant to bring "Superlative Circus Wagon Sideshow Extravaganza," to ArtPrize Nine. Read on to learn more about this project, what inspires her, and more. Visitors will find three Circus Wagons installed along the Gillett Bridge walkway. Inside, there are three collections, celebrating the superlatives found in the Art World - from the First (Public Art Piece - Calder's La Grande Vitesse) to the Deadliest (Art that kills! ), sculptures claiming an -est will be honored, in miniature form. One wagon focuses on the people crafting a career out of superlative-ness, one wagon focuses on the Est-ests of the Art World, and one wagon focuses on Michigan Monuments billed as World's Largest. World's Smallest Versions of each of these World's Largest provide a profile of Michigan, Public Art and the Art World as a whole. This is a continuation of a 15-year investigation into the world of World's Largest, self-made worlds, and their intersections with the formal Art world. While the investigation path is well-traveled, the wagons feature more than 30 new pieces exploring topics specific to ArtPrize, Michigan and current Art World Wonders. I will always be in love with Marcel Duchamp's "Bicycle Wheel," as an example of minimal intervention with maximal effect. I have a small version of it in my Siamese doves' birdcage. I spend the bulk of my time on the road, exploring rural environments. From the structures that fed our migration (highways, waterways, energy transportation, cultural expansion constructions) to the abandonment of the same, the objects, structures, remnants we leave behind as a culture create a playground for the imagination, informed by the histories we cross. In exploring the paths recently abandoned, I find who we were, and who we're becoming. All of these explorations combine into a bizarrely wonderful cross section of makers, doers, sustainers and fellow roadtrippers, exchanging experiences and information. I would love to be the first space junkyard operator. With a small gravitational field at its core, I would gather the debris and detritus, flotsam and jetsam from our first half a century of shooting stuff up and 'away,' open to the public for sale or trade, but also as a source for my own found object sculpture projects. It would also be an appropriate continuation of canines in space, as any good junkyard necessitates a junkyard dog.